There are few countries in the world that can match Germany for quantity and quality of castles. Now, if you can’t manage the 4 hour drive down to Germany’s most famous castle Neuschwanstein (the one Disneyland copied) on the Austrian border, then within an hour you can reach some pretty stunning castles with great views and surrounded by the vineyards that produce not just the famous Riesling brand, but also many less famous wines. The region, known as Rheinland Palatinate stretches along the Rhein river where it turns north after Bingen and goes up until Koblenz. Almost every town and village on both sides of the river is home to wineries, vineyards, castles and historic buildings. The Western bank of the river is the most picturesque with the most interesting castles, but both sides are notable. 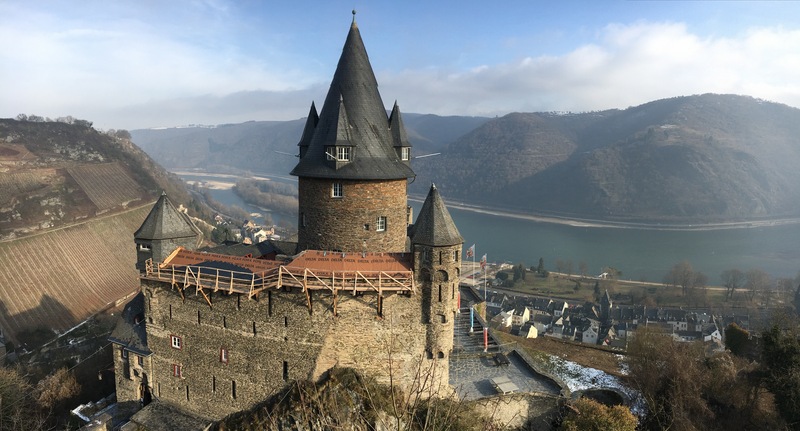 These are real fortified castles rather than palaces as the region was contested by many armies over the last 1000 years as the European powers fought for control of the traffic and toll money on the Rhein. I went by car for this trip, crossed the river in Mainz and drove up the main road along the river. This allowed me to stop at every interesting castle and explore up the many little wine producing valleys off into the hills. There is also the train connection which follows the same route and stops at most of the large towns on the Western bank. A really interesting day trip option would be to go with a boat company though. If you book with the Primus line in Frankfurt, they will send you up to Loreley by bus in the morning, and bring you back by river cruise in the afternoon from St. Goarshausen. It means that you have about an hour of free time to admire the views, but of course, you will have to enjoy the castles from a little distance with a few glasses of wine on the boat. In terms of timing, you should plan your trip between Easter and Christmas. 90% of the castles and businesses are closed in January and February (as I found). If you have the time, the best thing to do is to stay the night at one of the castle hotels. 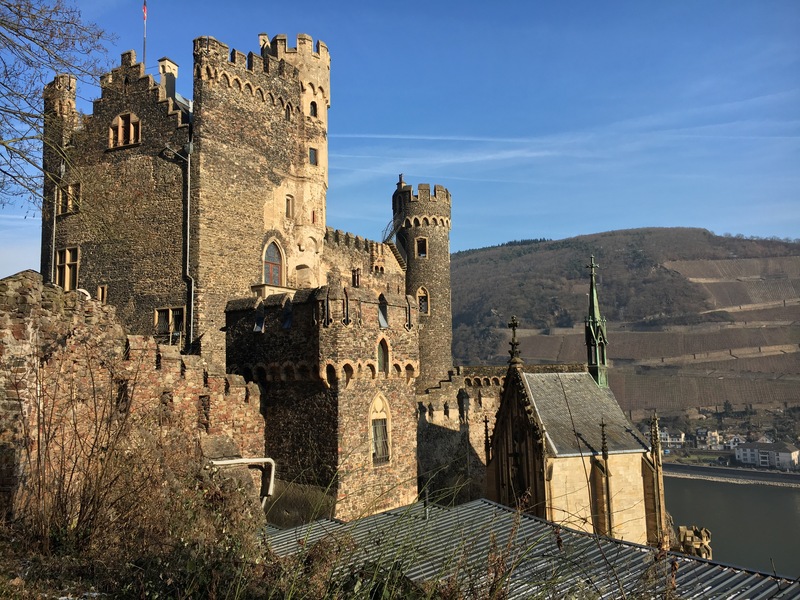 Three good options for you are the dramatic and forbidding Reichenstein Castle which is a little upmarket but well worth it especially for the restaurant. Slightly further up the river is the budget option of a youth hostel in a castle over looking Bacharach. 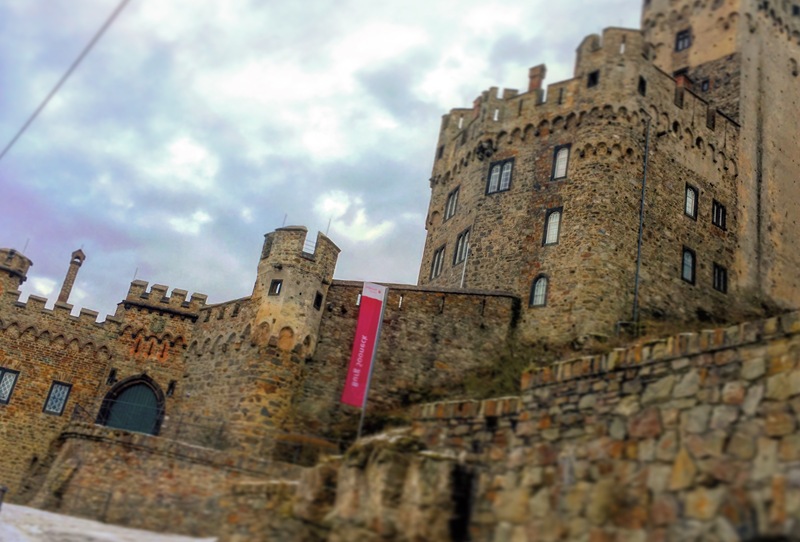 You will find several more hotel/castles on the river, but another dramatic venue is in the partial ruins of the massive Rheinfels castle, once the largest and most modern fortification of the German empire. At pretty much every location you will find a number of wineries offering tasting sessions of local wines along with smaller preserved and ruined castles hidden up valleys or perched on every other river bend. Take some time, book a winery, explore the historic towns with their intact walls. Perfect if you have visitors coming for a weekend and almost impossible for you to choose a bad place to visit.